The nine-primaried oscines form a strongly supported group (Klicka et al. 2000; Ericson and Johansson 2003; Barker et al. 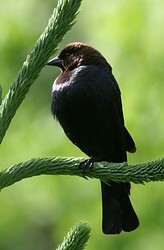 2004), including the families Fringillidae (finches), Emberizidae (buntings and New World sparrows), Icteridae (New World blackbirds), Parulidae (New World warblers), Thraupidae (tanagers), and Cardinalidae (grosbeaks). Fringillidae is the sister of the others (Klicka et al. 2000; Yuri and Mindell 2002; Ericson and Johansson 2003; Barker 2004). Two genera previously considered emberizids, Calcarius (longspurs) and Plectrophenax (snow buntings) are sister taxa of each other and together the sister of the remaining nine-primaried oscines (Klicka et al. 2000; Yuri and Mindell 2002; Ericson and Johansson 2003). Relationships among the remaining five families are contentious. Of analyses with representatives of all five families, most unite Cardinalidae and Thraupidae (Bledsoe 1988; Barker et al. 2002, 2004; Yuri and Mindell 2002), though two (Sibley and Ahlquist 1990; Harshman 1994; Klicka et al. 2000) do not. Again, most unite Icteridae and Parulidae (Bledsoe 1988; Barker et al. 2002, 2004), though two (Klicka et al. 2000; Yuri and Mindell 2002) do not. But support for the minority arrangements are weak. The position of Emberizidae is unclear; Barker et al. (2002, 2004) have strong support for relationship to the cardinalid-thraupid clade; Bledsoe (1988) found a relationship to the parulid-icterid clade; Yuri and Mindell (2002) and Klicka et al. (2000), though failing to find the parulid-icterid clade, did find a clade consisting of Emberizidae, Icteridae, and Parulidae. For the present, relationships of Emberizidae are best treated as unresolved. Barker, F. K. 2004. Monophyly and relationships of wrens (Aves: Troglodytidae): A congruence analysis of heterogeneous mitochondrial and nuclear DNA sequence data. Mol. Phylogen. Evol. 31:486-504. Bledsoe, A. H. 1987. DNA evolutionary rates in nine-primaried passerine birds. Mol. Biol. Evol. 4:559-571. Ericson, P. G. P., U. S. Johansson, and T. J. Parsons. 2000. Major divisions in oscines revealed by insertions in the nuclear gene c-myc: A novel gene in avian phylogenetics. Auk 117:1069-1078. Harshman, J. 1994. Reweaving the Tapestry: What can we learn from Sibley and Ahlquist (1990)? Auk 111:377-388. Klicka, J., K. P. Johnson, and S. M. Lanyon. 2000. New World nine-primaried oscine relationships: Constructing a mitochondrial DNA framework. Auk 117:321-336. Sibley, C. G., and B. L. Monroe Jr. 1990. Distribution and taxonomy of birds of the world, Yale University Press, New Haven. Yuri, T., and D. P. Mindell. 2002. Molecular phylogenetic analysis of Fringillidae, "New World nine-primaried oscines" (Aves: Passeriformes). Mol. Phylogen. Evol. 23:229-243. Page: Tree of Life 'Nine-primaried oscines'. Authored by John Harshman. The TEXT of this page is licensed under the Creative Commons Attribution-NonCommercial License - Version 3.0. Note that images and other media featured on this page are each governed by their own license, and they may or may not be available for reuse. Click on an image or a media link to access the media data window, which provides the relevant licensing information. For the general terms and conditions of ToL material reuse and redistribution, please see the Tree of Life Copyright Policies.